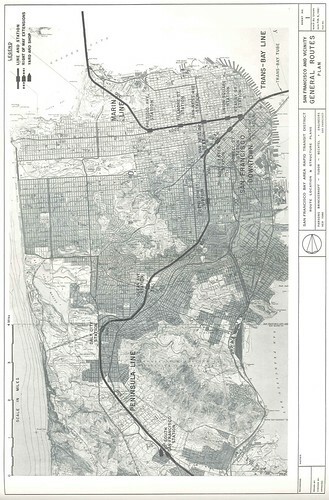 1961 BART Marin Line Plans. Click to enlarge. Building a rail line to San Francisco is the Holy Grail for many in the commuting public. By 2035, there will be an estimated 80,000 commute trips across the Golden Gate Bridge every day, and both San Francisco and the SMART district counties could be well-served by a rail line going across the Golden Gate Bridge. It sounds like a fabulous idea, but would it actually be worth the expense? Let’s pencil this out. SMART, presumably, would run along the old NWP railroad tracks to Sausalito, duplicating the old rail route. 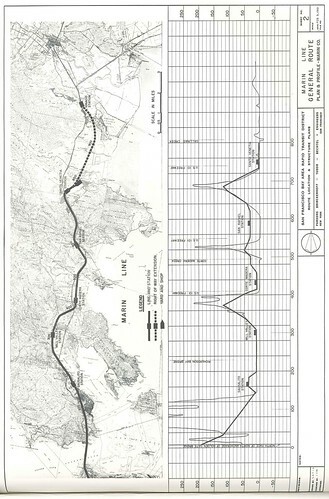 From there, would proceed as the old BART plan did, tunneling through the Marin Headlands to the Golden Gate Bridge and San Francisco, becoming a subway thereafter to run under Geary Boulevard before finally terminating at either the San Francisco Caltrain station or the Transbay Transit Center. The Marin section would cut through Larkspur and Corte Madera, running at surface, bypass downtown Mill Valley and most of Sausalito before diving beneath the hills. Larkspur to Sausalito costs would likely be higher than the rest of the rail line, as the old rails have been torn up for trails. Given the cost of renovating the Alto Tunnel as well, a cost of $174 million – $20 million per mile – is not unreasonable. The fact that this would run through some very low-density residential neighborhoods, however, would likely mean significant neighborhood opposition. Running along Highway 101 would be significantly more expensive, as there is no single right-of-way for SMART to operate with, and there is no freeway median for the train to run down. Sausalito to San Francisco would be a major undertaking. The Marin Headlands present a major tunnel project, and crossing the Golden Gate Bridge would be a huge engineering endeavor. Since all construction would be new and involve a tunneling project, from this point on the project would cost around $150,000 between $500 million and $1 billion per mile. The line would continue on the BART alignment once it reached the city, hitting its first station at the Presidio, serving Industrial Light and Magic, before tunneling to Geary. Total cost for this segment would be between $3 billion and $6 billion. 1961 BART San Francisco Plans. Click to enlarge. The Geary Boulevard alignment is important for this plan. Muni bus service along the Geary route is over capacity and is the busiest bus route in the Bay Area. The neighborhood has begged Muni for a subway but to no avail, as costs are extremely prohibitive, but from a transit perspective the project would be worthwhile. Here, SMART has a choice. It could stop at a Geary Boulevard transfer station, probably on Arguello or Masonic and allow passengers to transfer to Muni, or it could continue onward in the Muni tunnel. There are costs to either choice. Forcing passengers to transfer to Muni far from the Financial District would make the route less attractive to potential riders, but partnering with Muni to build the subway would be extremely expensive. Despite this, the odds of actually building the subway would increase if Muni were to shoulder the cost with another transit agency, and the intra-San Francisco passengers would help to offset some of the cost to SMART. If SMART chooses to go on, it would proceed along Geary with stops along the way until Market Street. The cost for this segment would be around $330 million between $1.1 and $2.2 billion. At Market, SMART again faces a decision. It could proceed along the Central Subway to the Caltrain terminal, requiring express rails to be put in at considerable cost. It could proceed forward to the Transbay Transit Center at an even more considerable cost, or it could stop at Union Square, allowing passengers to transfer to the Central Subway or BART and finish their trips. The cost of the crossing under Market would likely be at least $1 billion but would provide a significant improvement in service to passengers, allowing a single rail ride from Santa Rosa to California’s High Speed Rail network, Caltrain, and a number of regional buses. The total cost of a San Rafael to Transbay Transit Center line, using these numbers, is $2.5 billion between $5.3 and $9.6 billion. The problem for this line is that ridership just is not there. Already, 28% of commutes to San Francisco from Marin are made by transit. If SMART’s numbers hold out through a whole system, only another 10% of ridership – about 8,000 – would shift to the train. This would bring Marin in line with the mode share for San Mateo-San Francisco commuting at a total cost of $147,000 $400,000 per new rider, minimum. To make it as cost-effective as SMART’s initial operating segment, 40,000 new riders per day would have to switch, an unrealistically high number without a significant change to growth patterns in the Bay Area an astronomically high number for Marin. Building SMART to San Francisco would be nice, but in a world of limited resources it would be a massive waste of funds. For that money, Golden Gate Transit could improve its bus system such that the towns it serves could begin to focus on transit-oriented development, SMART could extend to Sausalito, and there would be plenty of money left over for bike lanes, sidewalks, and a second track and electrification of the SMART route, and that only gets us through half the money. Unless costs come down, a San Francisco SMART should stay strictly theoretical. EDIT: After some off-line comments, I realized I had grossly underestimated the cost of subway construction without tearing up Geary, and updated the costs to reflect that.